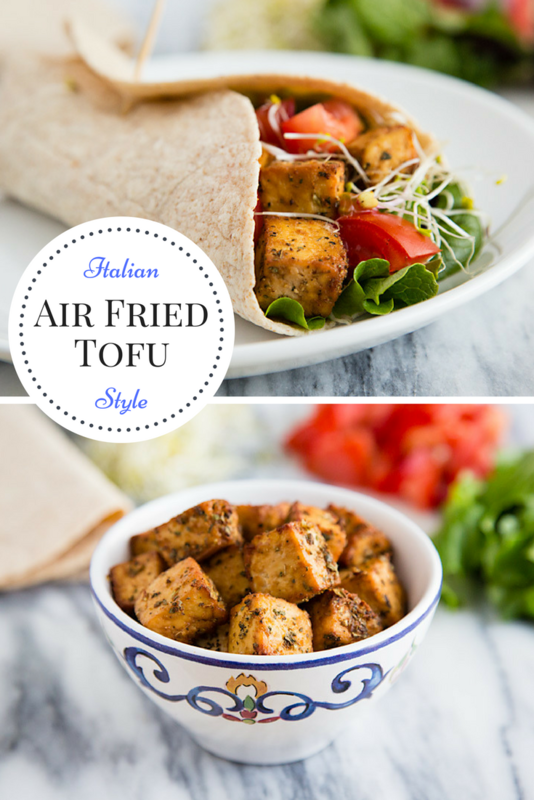 Italian Style Air Fried Tofu is the perfect filling for a delicious vegan wrap. 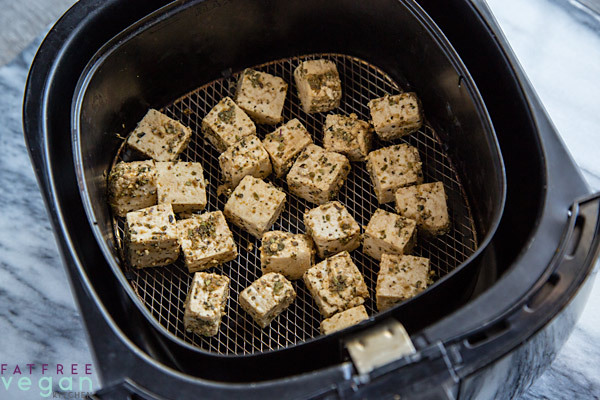 The air fryer makes the tofu chewy and slightly crispy, with no added oil. I’ve had an air fryer for well over a year and even started a Facebook group, FatFree Vegan Air Fryers, to share cooking ideas. I’ve posted several air fryer recipes, but I’ve never taken the opportunity to write about the air fryer in depth, to review the different air fryers, describe how they work, give formulas for converting “regular” recipes for the air fryer, etc. I don’t think air fryers are really necessary. And if you don’t have one, you can still make this air fried tofu because I’ve included oven directions at the end of the recipe. Let me also qualify my statement that they aren’t necessary by confessing that I mostly use mine for only two foods: potatoes and tofu. Every now and then I make burgers and air fry them in the Breville, but I use my Phillips mostly to make “French fries” and tofu. So I’m hardly an expert on air frying, though that doesn’t stop me from having an opinion. There are a few advantages to air frying instead of baking. Before I get to them, I want to say something controversial: I don’t consider the Breville Smart Oven Air (BSOA) a real air fryer. Now, I love the thing and use it daily for baking and reheating (it will hold a full-sized pan of lasagna, I kid you not), but as an air fryer it is huge but lackluster. I consider the air frying setting a gimmick, a very successful one by the number of people who have bought it. It works okay, but most of the following advantages of air fryers do not apply to it. Something about having hot air whipping around at hurricane speeds means that you don’t have to use as high a temperature as oven cooking. I reduce the temperature of a conventional recipe by as much as 70 degrees F when I make it in an air fryer. Note: This does not apply to the BSOA. I find that everything needs to be cooked at much higher temperatures with the Breville’s air frying setting. For instance, I make thin French fries with the Phillips at 360F but have to turn the BSOA up to 425F. Because air is circulating through the mesh basket, food doesn’t have to be turned as often and is less likely to stick badly. But I find that I do need to loosen and rearrange the food at least once halfway through cooking so that it cooks evenly. I do this with a thin spatula; even though instructions will often say to “shake the basket,” often food is too stuck to really shake loose. They’re one-use appliances that take up space in the kitchen. The better ones can be expensive. The cheaper ones often have non-stick coatings that flake off. Read the reviews on Amazon before you buy. Unless you’re used to fat-free food, you won’t find air-fried food much like fried food. A lot of buyers have felt disappointed that the results didn’t match the hype. And yes, you can cook without any oil in an air fryer, despite what the user manual states, though I’m sure that using a little oil would give the food a more realistic fried texture. While the Phillips is easy to clean because you can soak the basket in the main compartment, the Breville’s air fryer basket may be too big to fit flat in the kitchen sink, so it’s hard to soak. It also is not meant for cooking food that drips because of the heating element at the bottom. Food can easily drip through the grill and burn onto the bottom. If you’d like to buy an air fryer, I’m not trying to dissuade you, but I think it’s important to know these things going in. The air fryer does something magical to tofu. It crisps the edges and makes it firmer and chewier, all without you having to freeze it or press it with fancy tofu presses. It’s absolutely addictive, and it’s oil-free. I often make air fried tofu for stir-fries by marinating it in a mixture of soy sauce and sriracha, soy sauce and chili garlic sauce, soy sauce and a dash of sesame oil and garlic. The only essential is the soy sauce. I find tofu unappealingly bland if it’s not salted, and soy sauce adds the salt as well as the umami flavor. What I do not add is starch. I tried just once adding starch to my tofu, and it was nowhere near as good as it is “naked.” It left a powdery residue in my mouth that I wish I could forget. 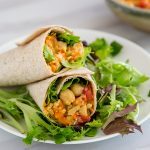 Last week I was trying to pull a last-minute lunch together from limited ingredients–not enough of anything to make a big salad but just enough salad vegetables to stuff a couple of wraps. I was tired of hummus and wanting something different, so I quickly marinated some tofu in Italian seasonings while the air fryer was preheating. Italian style air fried tofu was born. I posted the photo of that lunch on Instagram, and so many people wanted the recipe that I knew I’d have to make it again and keep track of the amounts I used of each ingredient so that I could post it here. That was no hardship! I loved it so much that I’ve had it four times in the past week, and I hope you’ll love it, too. Using an air fryer makes this savory tofu crispy in record time, but if you don't have one, see the notes for baking in an oven or toaster oven. Also, the longer you marinate, the tastier the tofu will be, so start it soaking early for the best flavor. Return the tofu to the cutting board and cut each piece into about 10 cubes (one cut down the length and then 5 across works well.) Place the tofu in a large ziplock bag or bowl. Mix the remaining ingredients well. Pour over the tofu and gently turn the bag or stir the tofu until all sides are coated. Let it marinate at least 10 minutes--the longer you marinate it, the more flavorful it will be. Preheat your air fryer at 390-400F for about 3 minutes. Place the tofu in a single layer in the basket (leaving any marinade behind) and immediately reduce the temperature to around 350F. Air fry for 6 minutes. Use a thin, flexible spatula to loosen the tofu and turn it. Return it to the air fryer and begin checking at 4 minutes to see if it is golden overall and slightly darker at the edges but not overcooked or it will be tough. Use any way you like--my preference is in wraps with plenty of veggies and balsamic vinaigrette--but it's also good in pasta. Aquafaba is the liquid from cooking chickpeas. 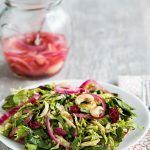 In this recipe, its main purpose is to dilute the soy sauce and help spread the flavor around, so any liquid will do. To bake in the oven, line a baking sheet with parchment paper or a silicone liner and bake at 400F for about 20 minutes, turning after 10 minutes. Sodium listed in the nutritional info is for regular soy sauce; use low sodium soy sauce to reduce the sodium. Or replace the soy sauce with a flavorful liquid such as wine to drastically reduce the sodium. This tofu is zero points on Weight Watchers new Freestyle program. The recipe makes about 20 pieces, enough to fill 4 medium-sized tortilla wraps. 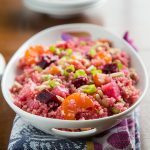 Tried this recipe?Post a photo and mention @susanffvk or tag #fatfreevegan! Please let me know in the comments if you have any questions that I didn’t answer about air frying. This post contains Amazon affiliate links. When you buy something through them, I receive a commission that helps support this site. Thanks for your purchase! Wow looks delicious. Will try the recipe this week! That’s a great tip! I didn’t care for the way broccoli tasted in the air fryer, but I’m glad I didn’t have that experience. I almost put down “spices and stuff blow out the back” as one of the downsides. I may have to add it! I also had a regular Smart Oven before the Air, and my impression is that the air fryer setting on the Air isn’t any stronger than the convection fan in the regular Smart Oven. That’s why I feel it’s a gimmick. I do like to use it for making large batches of fries or tofu, but I don’t like it for anything “drippy” that can drip all over the heating element and bottom of the oven. Good to know…thanks! I wondered if the oregano and basil in this recipe might dry and blow off in the fans, too? Not that it’s the end of the world, but helpful to know. My kale chips (I used collard greens) actually flew out of the basket while cooking and I found half of them *under* the basket! I ate them…and have been finding little green specks blown onto the kitchen counter and elsewhere. I didn’t find any “herb residue” after cooking this, like I do when I sprinkle fries with seasoned salt. You can kind of see how much seasoning is still on the tofu in the photos. I had a bad experience with kale chips too, flying up into the heating element and burning. Some people use a piece of metal mesh to hold them down. I’m in position where a countertop oven the size of the Breville would be an asset, and have been considering upgrading from my Cuisinart air fryer toaster oven because if the size. But I too wonder about the gimmick nature of it all. There’s no doubt it cooks much faster, which we like. Do you think the extra expense is worth it between the two Breville models? I really like the size of the Breville Air; it’s much bigger than my last Smart Oven, and for that alone I think it’s worth the price. (I have an ancient, unreliable wall oven, so the Breville is my primary oven.) One downside is that it seems to take longer to toast bread, but overall I think it’s worth it if you need a really big countertop oven. Thanks so much for all this info! Bought my Instant Pot in part based on your reviews, and appreciate hearing that I can probably live without an air fryer … for now, at least. 🙂 We do love our tofu around here, so I guess we’ll see. I’m excited to try this Italian-flavored version! Such a delicious and easy recipe Susan. I have a wonderful tofu press so its even easier. Thanks for all the extra information, you answered a lot of questions I had on the air fryer, which I really don’t want. I’ve used the instant pot exactly once but maybe once the weather gets hot I’ll be more motivated! I know you have a lot of recipes using it. I love the Instant Pot for soups, stews, and beans, but I’m not one of those people who want to cook everything in it. It really speeds up cooking dried beans, but for a lot of other things, it isn’t any faster than the stovetop. The only other benefit is being about to set it and do other things without hovering over the stove. I hope you’ll give it another try with one of my IP recipes (see the link at the bottom of every page.) I really recommend any of the split pea or lentil soups. This recipe looks awesome and I’ll definitely try it. But I have a question about the Air Fryer. How much heat does it put off into the kitchen when you are cooking something at 400 degrees? Thanks for posting this. I haven’t tried this with tofu, but I do make french “fries” by putting my cooling racks for cookies in a large cookie sheet and baking potato pieces on this, and also have the red copper “fry” basket for the oven. My oven has a convection setting so I use that. I’m thinking this might give similar results to the air fryer? Your comments on the pros and cons of air fryers in general and the Breville in particular are very helpful. Thanks for giving us an honest opinion. Thank you so much for this thoughtful post. I do not have one more inch of space in my kitchen for another small appliance and felt that I was missing out not having an air fryer. You have solved that problem! One question. You mentioned convection. I do have a convection setting in my oven. Do you know if that would come closer to producing the crisp edges you describe vs. a regular oven setting? I have never thought to use that setting for tofu.I am looking forward to making this recipe. I think that the convection setting in your oven plus one of those baskets you can buy on Amazon would come very close to mimicking an air fryer. I haven’t bought one myself, but I’ve seen other people post photos of their oven-frying baskets, and they look similar to what comes with the Breville. They allow the air to circulate more freely than a baking sheet would. I have never ever left a comment on a recipe before. As soon as I received this recipe in my inbox I knew I was going to give it a go. I followed the recipe perfectly. I put the marinade in a plastic baggie and threw the tofu in. Gave it a good few shakes and placed the tofu on a tray lined with parchment paper. Popped the tofu in the oven, turned it after 10 minutes and it turned out amazing! Crispy on the outside and she we on the inside! Thank you so much for this delicious recipe! Susan, I found a source for your model of Phillips. Would you re-buy it if you didn’t have one. We love tofu dishes so just wanted your input. I would actually not buy that one but get a bigger one, unless you only want to do small amounts of tofu or potatoes. I love the Phillips brand, and would get one of their larger models. I have a double wall oven (regular Oven size) that are also convection. What temperature for this? Obviously it’s different than an air fryer. Which Phillips air fryer do you have? I looked at amazon and they are $200+. Is that what you paid for yours? Mine was originally $179 but I got it for $139 on a Black Friday deal. The larger ones are even more expensive. There are cheaper brands like GoWise that people like, and if you don’t want to pay a lot without knowing if you’re going to use it, you might start with one of them. Thanks for the comments about the air-fryer! It seems like a convenience, but not a necessity. Considering I live in a small one bedroom apartment, kitchen counter space is limited and definitely doesn’t need another appliance [that goes for my shelving too :)]. Thank you so much for this review! I’ve definitely been feeling the FOMO with the air fryer, but I’ve been having the exact doubts you mentioned. I’ll sit tight with my Instantpot and my Vitamix for now. And I’ll still for sure be making this tofu!!! This looks fabulous Susan – thank you 🙂 can’t wait to try it. I just have a little question and would so value your opinion. I like tofu but I don’t use it as often as I should. Mary McDougall says that it’s high in fat so beware….doesn’t look that high in fat to me. I have trouble with beans because they upset my gut quite badly so my options are few. I would be grateful to know your thoughts on this. Tofu many times more calorie dense than whole beans and grains, so she’s right. There’s no requirement to use tofu in a plant based diet. It’s strictly a personal choice. 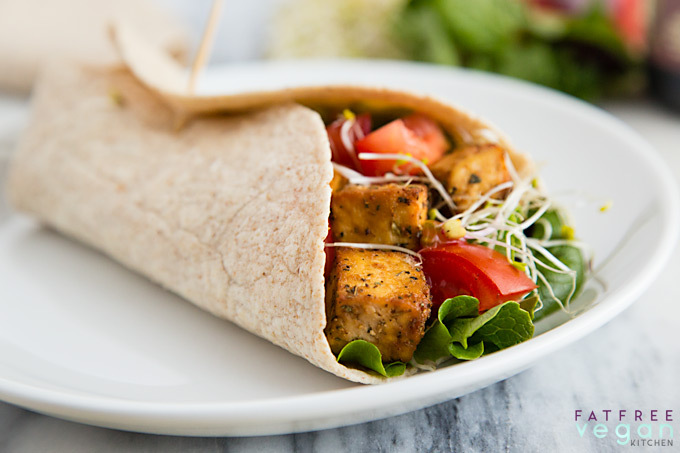 Aside from the tofu, what else is in your wrap? Looks delicious! If you have a convection oven, can that be used in place of the air fryer? I believe air fryers are mini-convection ovens, right? thanks! I made this tonight and it was a hit! My son and husband love tofu, so I knew they would like it. My daughter and I, not so much. We all enjoyed it a lot. The flavors are great. I did however, double the marinade because I didn’t have More than 10 minutes to soak. I served with rice pilaf, by the way. What a timely post! I bought a 5.3 Power Air Fryer XL yesterday! I’ve been wanting to try one forever, and a 30% off coupon pushed me over the edge. My question is: I’m vegan, my spouse is not. If I cook his meat in the air fryer will it still be safe for my plant-based foods? I don’t want to contaminate it! And, yes, I’m in this relationship forever…lol!!! We live in the desert where outside temps get up to 130* in the “summer”, and this is part of what sold me on the air fryer…it will not heat up the house. 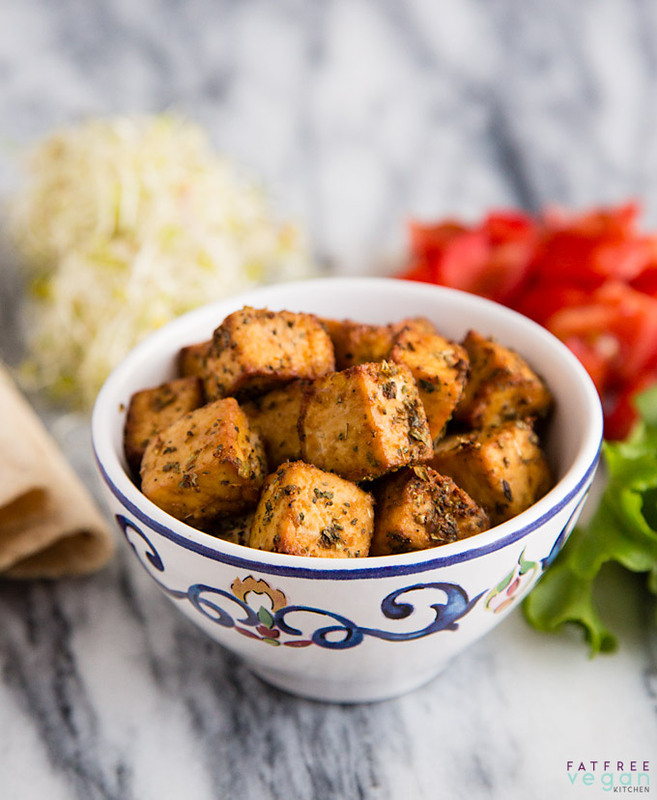 I’ve got a fresh pack of tofu…going to make this recipe my “virgin voyage” into air frying. Thanks for such a great blog! I cooked it as written and loved it. Then,I replaced the aquafaba with a really good balsamic vinegar. That was very good and added another layer of flavor. TY for this post, since air fryer buzz seems to be rampant. Will stick with Vitamix and InstantPot investments for now. After reading your post, I did get the idea to raise up my marinated tofu squares on a cookie rack placed on top of my parchment-lined baking sheet. This helped hot air bake them on all sides, and they were crispier! Traditionally, soy sauce wouldn’t be an ingredient in any of those countries’ cuisines, but I’m sure with globalization, it’s available there today. 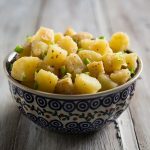 To me, it doesn’t matter if a particular country uses a particular ingredient; what matters is if in vegan cooking, that ingredient provides a depth of flavor that might otherwise be lacking. 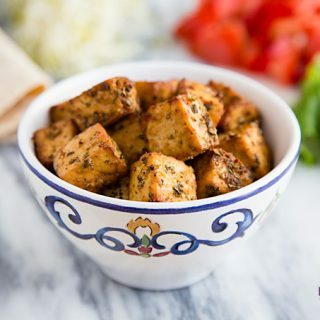 This is particularly important when cooking tofu, which doesn’t have any flavor of its own and which itself isn’t an ingredient used in those countries’ traditional recipes, but we use it to replace meat or cheese. In the same way, we use soy sauce and other ingredients like nutritional yeast to replace umami flavors that in non-vegan cooking come from meat, dairy, and eggs. Made this tonight and loved it! My husband the reluctant tofu eater also said, “wow! This is really great! I didn’t think I would like the tofu, but I do!” We had it with polenta and braised root veggies. Can’t wait to try this out for my husband. He must love it much. Thanks. My sister has told me a number of times that I need to try this recipe. It’s next on my ‘Recipes to Try’ list. Can’t wait, because your pictures look amazing! Thanks for your recipe; it’s the first thing I’ve made with my new airfryer. It turned out exceptionally well!!! Delicious flavours and textures. I left them in c.8mims longer in total, then added them to a wrap with some vegan mayo and fresh corriander leaves. Superb!!! Had it for about 6 months now, using it frequently. I love this fryer! Just made salmon in it tonight and it was so easy, 10 minutes to cook and it was delicious! Mmmm What a quick, easy recipe! Even though my air fryer is just a small one so I had to cook it in two batches, it turned out beautifully and tastes delicious! This one is a keeper! Thank you! My first time ever trying tofu thanks to this recipe. It was delicious, but mine did not come out crispy and gorgeous like yours, despite cooking it longer. Wonder if I should have done two smaller batches as mine were kind of crammed into my small fryer. It was good enough that I will try again, though. Thank you! When I’m making tofu, mushrooms, burgers and the like in my basket air fryer, I add 4 ice cubes to the basket when I loosen the food (halfway through cooking). It makes a big difference in the final product. Your tofu looks delicious. I can’t wait to try it! I’m not familiar with the new wave. If it’s like a convection oven, then yes, I think it would work. What other liquid can I use instead of aquafaba?